An alleged wrongful demolition exercise at Miotso in the Greater Accra Region is creating fear and panic as victims are swearing fire and brimstone to take all legal means to reclaim their property. On the dawn of Tuesday, a team allegedly invaded Miotso in a James Bond style, and pulled down landed property on the sprawl between Mile 28 and Mile 29. Armed with a demolition order from the Tema High Court, the team carried out the exercise at dawn only to realise at the break of day that the area that the court had demarcated for the demolition was the sprawl between Mile 30 and Mile 31. As a result, victims are appealing to the state to immediately rebuild the structures or have the heads of the Judiciary and the Police dragged before court. Mr Nicholas Agbomadzi, one of the victims of the demolition told journalists that his fence walls which was pulled down by the team was constructed with a loan facility he took from his bank and was still repaying. Mr Wise Horgli, of J.K. Horgli and Transport, another victim made it clear that he and his father's company would not hesitate to sue for justice if the state did not rebuild their storey building as quickly as possible. On Tuesday, the demolition sites were thronged by members of the Dawhenya Traditional Council, led by Nene Kwaku Darpor l, Chief of Dawhenya, to protest against the demolitions. Nene, who stressed that the lands on which the demolished property was built was duly acquired, said that Nicholas Agbomadzi's demolished structures had for instance been on a land duly acquired from the Adden Darpoh family of Dawhenya and decried the reckless manner in which it was destroyed. The demolition order was issued by the Tema High Court on 27th July 2012, in respect of a case titled; Kweinor Tei Kwablah Versus Nii Okai Adjei and Angola Ghana Limited. Justice John K. Owusu was clear about the coverage area for the demolitions, noting the demarcation as, the land situated at Kopodar near Namue Hill, north of Great Ningo and bordered on the north by the Accra to Aflao Highway. The same land, according to the judge, was demarcated from a concrete pillar at Mile 30, leading eastward to Mile 31 toward Nyigbenya; then bound on the eastern, western and southern site by Greater Ningo Land. The demolition order was duly signed by the Registrar of the Tema High Court, Sebastian A. Agbo. In spite of the detailed demarcation which showed that the coverage area was between Mile 30 and Mile 31, the demolition team rather demolished buildings on the land between Mile 28 and Mile 29. 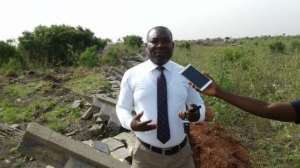 ASP Joseph Darkwah, a spokesperson for the Tema Regional Police Command, has since parried blame for the dumb mix up, stating that the Police do not and did not carry out demolitions. Instead he said the police personnel from the Command were there to provide security. He told the Ghana News Agency in a telephone interview that the police were not privy to the details of the areas demarcated for demolition, but were there to provide security as the land in question was contested for.